Cute, crafty, and brightly patterned with yellow and black chevrons! The Limosa harlequin frog is a terrestrial species endemic to Central Panama that live in moist, tropical Atlantic forests. In the wild, you could once spot this species among the dark rocks or mossy patches on the banks of streams. It is here, in the fast-flowing rainforest streams that enthusiastic males call and use their characteristic hand-waving behavior to signal females or warn competing males to steer clear. If successful, a male attracts a female and embraces her in a behavior known as amplexus. They laytheir eggs in fast-flowing streams for good reasons. The shallow, swiftly flowing water protects the eggs and tadpoles from potential predators and once they emerge as tadpoles the tadpoles cling tightly to rocks using the suction disks on their bellies while they graze on diatoms and other algae that grow on stones in these clear, oxygen-rich environments. This species is listed as Endangered on the IUCN Red List. 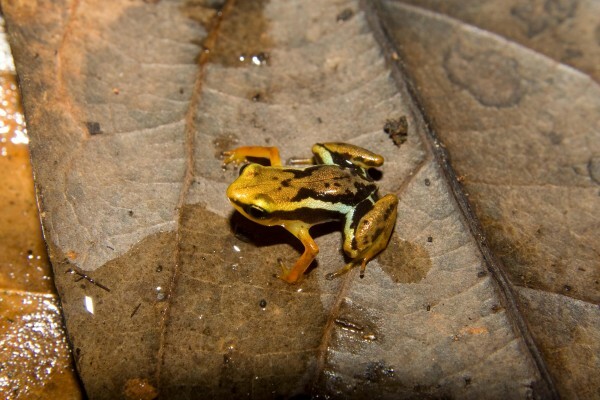 Atelopus frog species’ have been hit hardest by the growing chytridomycosis epidemic. 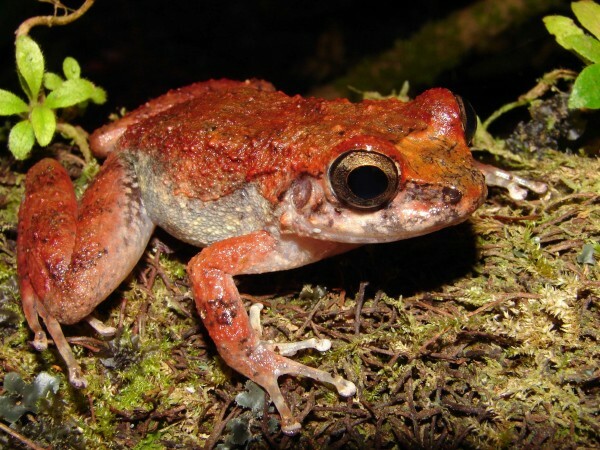 While deforestation of habitats for agricultural use and infrastructural development, stream sedimentation, and water pollution are also serious threats to Atelopus limosus, much of their range is in the Chagres National Park and scientists attribute the recent disappearances of this species to the emergence of amphibian chytrid fungus. Thankfully, the Panama Amphibian Rescue and Conservation Project has brought the endangered species into captivity and successfully hosts a very fruitful breeding population – no small feat at all! Did you know? 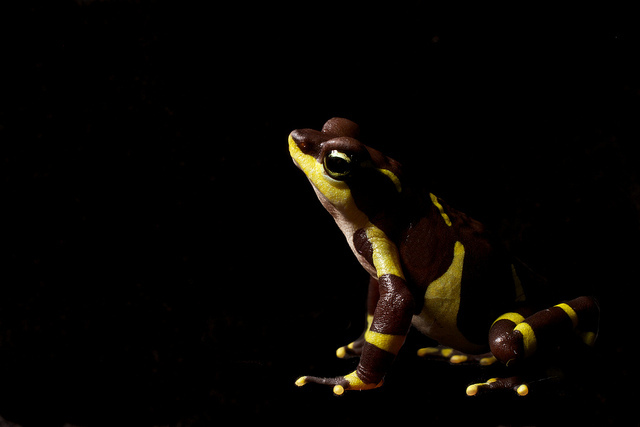 The limosa harlequin frog has two color forms; the brown form with a yellow nose and yellow fingertips mostly found at lowland sites, while the green/yellow form with black chevrons is normally found in the highlands. 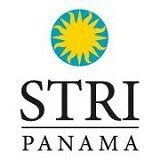 If you’d like to get a look at one of these amazing creatures, you can see them on exhibit at the Punta Culebra Nature Center’s Fabulous Frogs of Panama! The rainforest rocket frog is a small frog with a mighty leap! 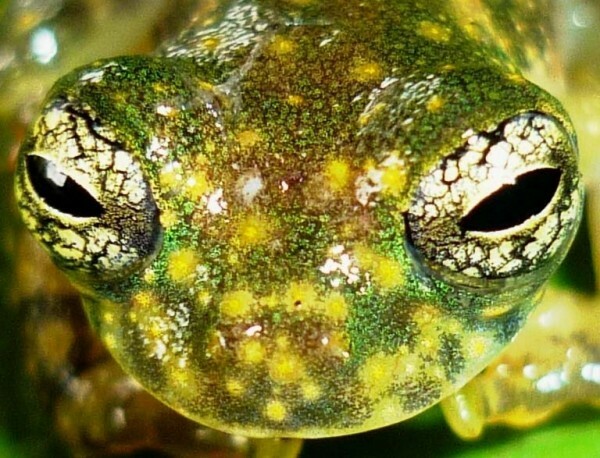 This species of frog occurs in humid lowlands from Costa Rica to Panama. It is a diurnal species with a wide distribution, is tolerant of varying degrees of habitat change, and has been well recorded in a number of protected areas. For these reasons, there is little concern over the continued survival of this species. 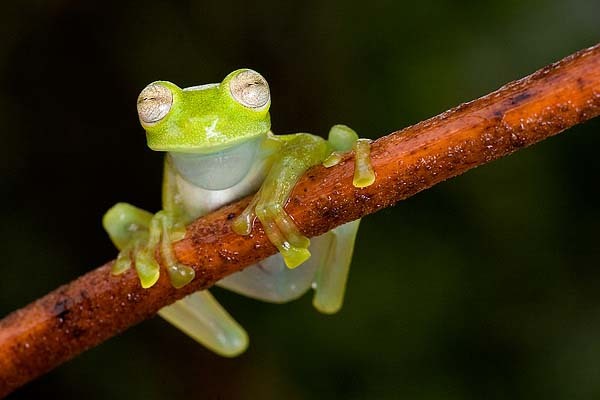 However, they are still threatened, like most amphibians, by general habitat loss caused by deforestation. Silverstoneia flotator consume a multiplicity of small arthropods. In the Punta Culebra Nature Center frog exhibit, Fabulous Frogs of Panama, the Rainforest Rocket Frog eats small fruit flies. Males are territorial and will wrestle with other males to defend their territories (Savage 2002). There is currently one male in the exhibit and five more rocket frogs will be introduced in the upcoming weeks. So there are sure to be some interesting encounters in the exhibit! Did you know? You can distinguish a mature male Silverstoneia flotator by its swollen middle finger. Males also have a pale grey throat color, while females have white-colored throats. The female frog lays her eggs in the leaf litter of a male’s territory, and when they hatch the male transports the tadpoles to nearby streams (Savage 2002). This is just one of many diverse reproductive strategies seen in Panamanian frogs. Stay tuned for next week’s #frogfriday to continue learning about the frogs of Panama! 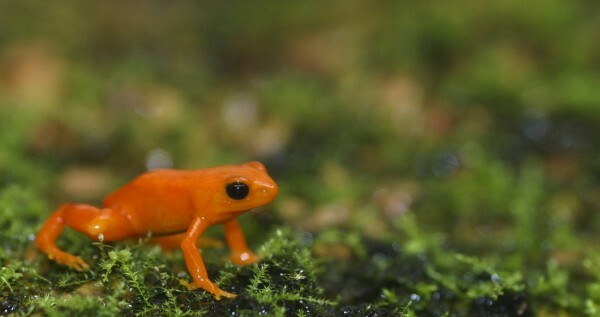 The golden mantella, Mantella aurantiaca, is yet another of the world’s critically endangered golden colored frogs. It comes from Madagascar where it is associated with screwpine forests and has a tiny range of 10 square km. Popular in the pet trade, this species is threatened by an unsustainable demand from hobbyists and was listed on CITES appendix II listed species in 1995 to limit the trade. In 2000 all Mantella species from Madagascar were also added to the list. Appendix II permits limited trade and Madagascar has an export quota for 550 animals each year. In addition to unsustainable harvest this beautiful little creature is threatened by habitat loss, including loss of breeding habitat due to gold mining. More than 1,500 golden mantellas are now managed by 50 zoos and aquaria around the world, and an in-country conservation strategy has been developed that you can read here. And now for my gummy-bear impersonation. 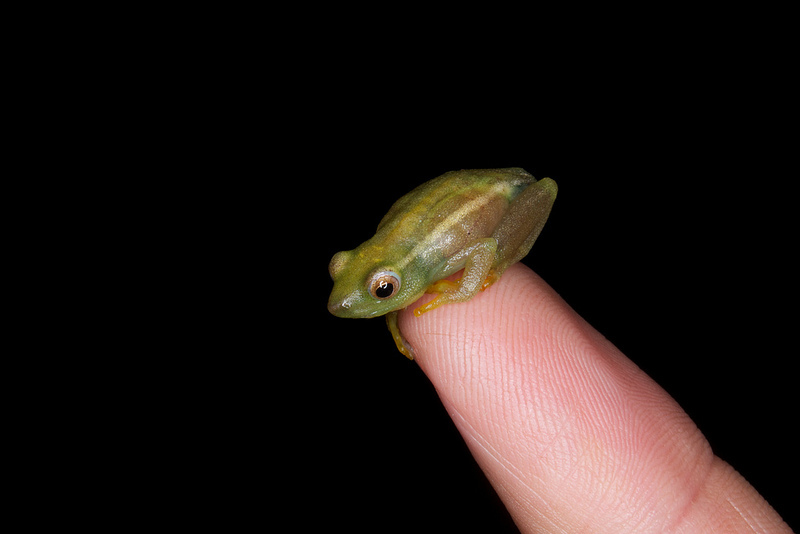 This easily overlooked, almost translucent little frog can be found in ditches and ponds in Southern Africa. The males perch like little green jewels on reeds on the water’s edge. They spar with other males on flimsy stalks for prime breeding spots and advertise their presence to females with a short almost insect-like rasping rattle. If successful at attracting a female, the amplectant pair will lay clutches of up to 200 gelatinous eggs on vegetation just below the water’s surface. 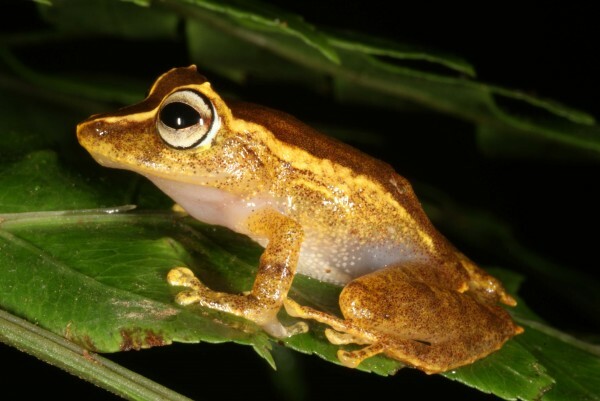 The taxonomy of this group of small, green reed frogs can be confusing, but the pale paravertebral lines in addition to the dorsolateral stripes are one characteristic trait of this species. 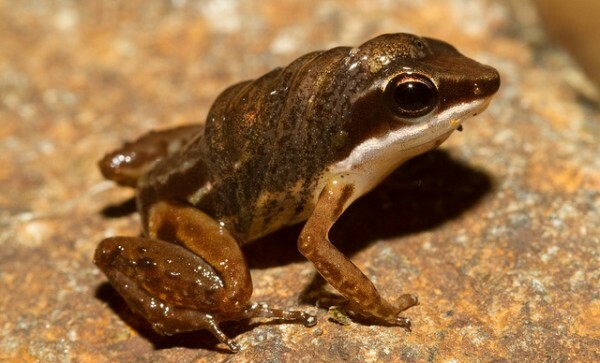 The frog is tolerant of disturbance and can be found in agricultural areas where it can be very abundant and it is listed by the IUCN as Least Concern. Next, to bend space and time. The hellbender has the distinct honor of being the largest salamander in the United States, growing as large as two feet long. It can be found in rocky, clear creeks and rivers, usually where there are large rocks for shelter. Its mottled appearance allows the hellbender to almost perfectly blend into its surroundings, making it quite the crafty salamander. Despite its name, this species is not a fan of warm water and strictly avoids water with temperatures above 68 o Fahrenheit/20 o Celsius. The principal threat to this species is habitat degradation since it is a habitat specialist with little tolerance of environmental change. While it may seem like the sensitive type, do not be fooled; this species knows how to defend itself when push comes to shove. 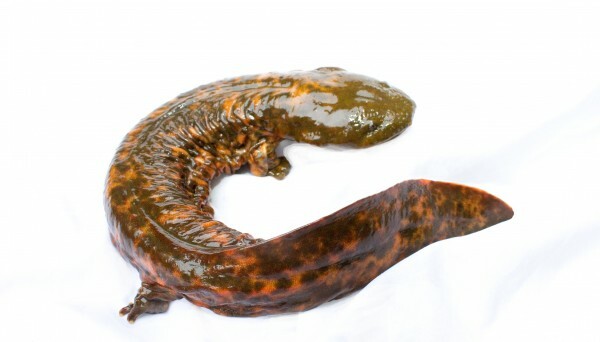 Hellbenders produce skin secretions that are likely unpalatable to predators and lethal in mice. At the current time the species is listed as near threatened by the IUCN. Follow the Smithsonian National Zoo’s hellbender work at http://www.salamanderscience.com/.